In an enthralling book, the author-teacher uses the powerful, ancient symbol of personality types, the Enneagram, to reveal who you are NOT, opening the mind to the infinite spaciousness of being — free of past, present, and future. The Enneagram, an ancient method of diagnosing our psychological fixations, has been interpreted in our time as an illusory medicine to cure an imaginary disease—the egoic idea of separation from God, from one’s true source. The cure is to employ it as the amazing wisdom mirror it was intended to be, to use it to see past all false identification to the truth of being. 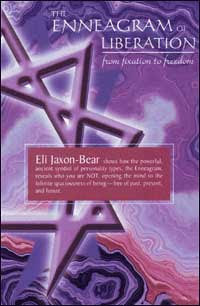 Eli Jaxon-Bear presents a radically new model of the ego and the psyche in a fresh approach to spiritual awakening by using the Enneagram’s nine fixated structures of ego to clearly describe who you are not. From the book: “It is a fortunate and mysterious moment when the desire for happiness leads to the investigation into personal identity, also known as self-inquiry. In the light of direct self-inquiry, limitations that once seemed to define oneself are discovered to exist only on the surface of consciousness in one’s imagination.” Among featured cover endorsements: “A warm, engrossing book … readers will be well served by its wit and wisdom.” — Russ Hudson and Don Richard Ruso, authors, The Wisdom of the Enneagram. ISBN : 81-89658-00-X; Price: Rs. 395; Pages: 195; Size: 6 x 9 in. I wonder if other authors are having the same problem of never receiving any royalty reports? I am so sorry to report that this publisher has proved unreliable and has broken our contract but continues to sell the book.